When was the last time you flipped over a rock (or a log) to see what was underneath? You can find all kinds of cool creepy-crawly things under there, if you're lucky. Our coolest finds over the years have included salamanders and enormous beetles. You never know until you look. Now get out there and join in! Find a rock and flip it over. Marvel at what you find. Replace the rock as you found it. Remember, your rock is likely someone's home. Be gentle, and if there are critters underneath, don't squish them when you replace it. It's better to move the animals to the side if you can, then replace the rock and let them scurry back. Record it in still photos, video, sketches, prose, or poetry. Load images to the Rock-Flipping Day Flickr group, post observations on your own blog, or just leave a comment on this post. We'd love to hear about what you found! 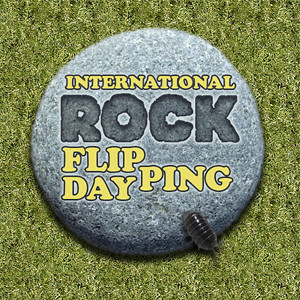 For anything besides a comment here, send a link to the coordinator, Susannah Anderson at Wanderin' Weeta, via email or a comment to her post on Rock-Flipping Day. Whether you share your observations or not, you can check back with Wanderin' Weeta to see what everyone sent her. She'll collect all the links and post them in one place. Now get outside and flip some rocks!